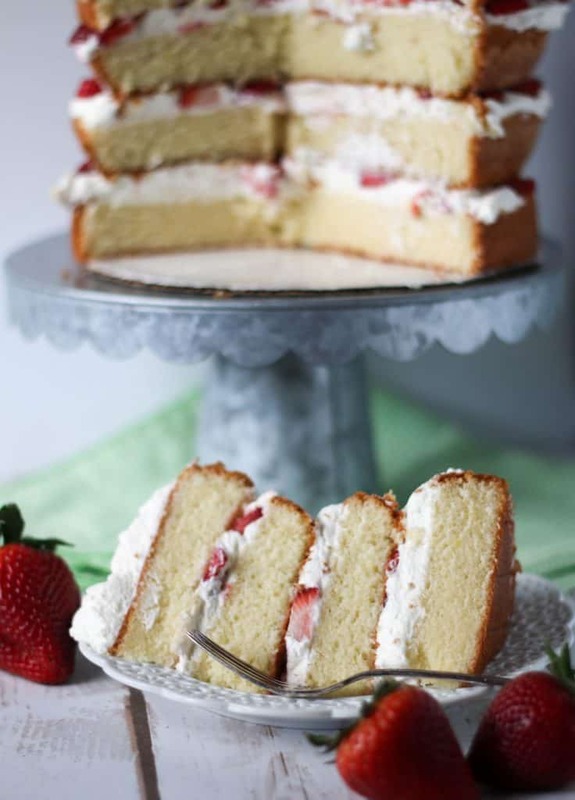 This is the perfect vanilla sponge cake recipe that is easier to make than you think. Top the layers with whipped cream and fresh strawberries for a perfect summer dessert! Your friend tells you they have the perfect guy for you. You just have to meet them. Perfect you say? You scoff. Not possible. Perfect Sponge Cake. Layer with whipped cream and call me done. I found it. What Is A Vanilla Sponge Cake? First of, what is a sponge cake? I mean all cakes are the same right? Definitely not. There’s sponge, genoise, flourless, pound cake. The list goes on. According to Craftsy, there are 10 different types of cake in all. Ten! But let’s just focus on sponge shall we? The two major types of cake are shortened or butter cakes and foam or sponge cakes. Sponge or foam cakes rely on air being whipped into the eggs to help the cake rise once its in the oven. In this cake, the whole egg is whisked with sugar over a double boiler and then whipped on high speed in your mixer to incorporate the air. 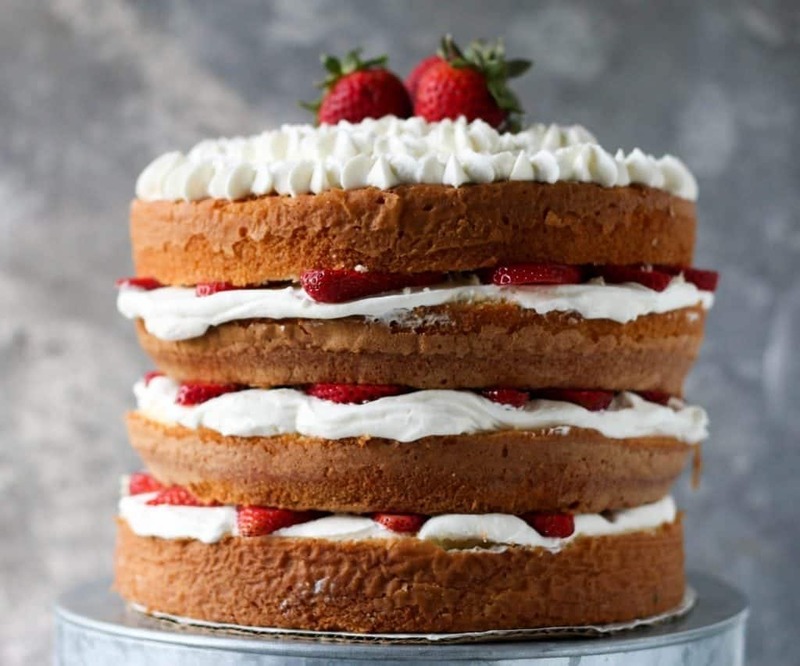 The key to making a perfect sponge cake is achieve full volume when beating the eggs and then trying to deflate them as little as possible when you add in the dry ingredients. In the end, the air that was incorporated during the mixing process expands causing the cake to rise. 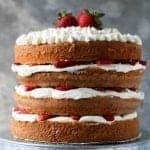 So in the end you have a light fluffy sponge cake that is perfect for a dollop of whipped cream and fresh strawberries piled on top. Step 1: Grease your cake pans properly with shortening and line the bottom of the pans with parchment paper. For a full tutorial on how to line your cake pans, read this post. 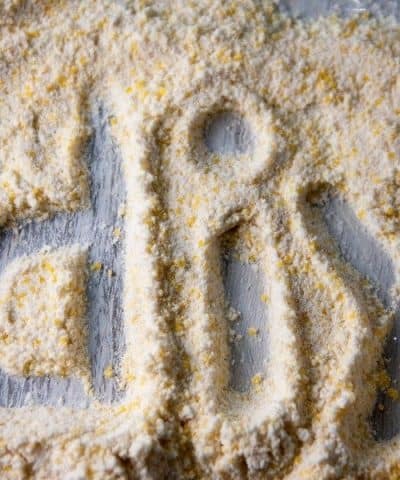 Step 2: Sift your dry ingredients together. Sifting is crucial to help ensure that your dry ingredients are incorporated evenly and to aerate the mixture. 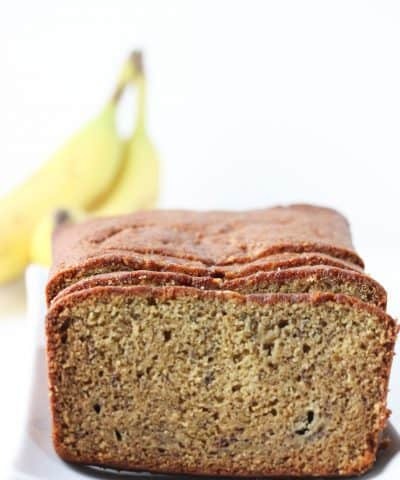 This cake uses cake flour, which is lower in protein content than regular all purpose flour so it helps to create a nice tender cake. For the complete Flour 101, you can nerd out on this post. Step 3: Combine your wet ingredients in a second mixing bowl. 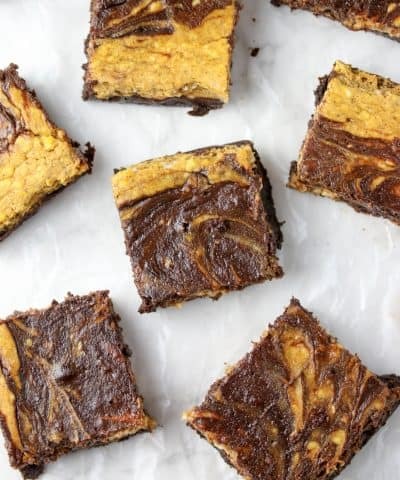 Just simply whisk together your oil, milk and pure vanilla extract. Step 4: In a heatproof bowl, you want to whisk your eggs and sugar together and set it over a double boiler. Just be sure the water underneath doesn’t touch the bottom of the bowl.You want to then whisk constantly. You need the mixture to get up 105°F. Pro Tip: Use a digital thermometer to get the job done. 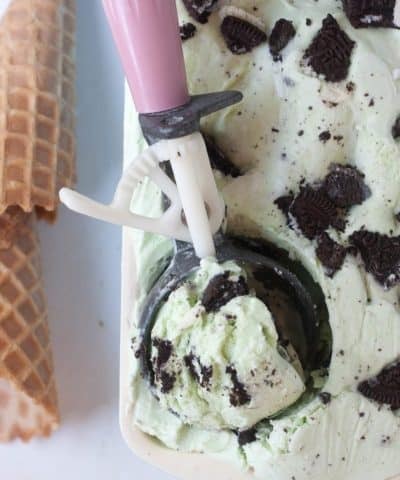 Trust me, this handy dandy tool will be used all the time if you get to baking as much as I do. Step 5: Once the egg/sugar mixture is up to temperature then you can add it to your stand mixer and whip the mixture on high speed until pale and thick (about 5 to 6 minutes) and then on medium for 2 to 3 more minutes to help stabilize the foam. Basically its going to look like pale yellowy ribbons of goodness. Step 6: Sprinkle the dry ingredients. 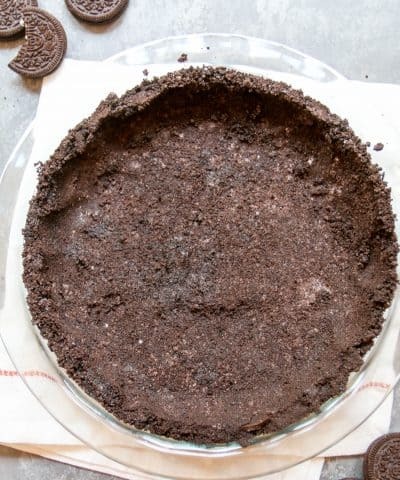 Then go ahead and drizzle the milk mixture in. Step 7: Divide the mixture between your pans and that’s it! Time to bake! See I told you that you could do this. Just divide the batter and bake! What Do You Frost This Vanilla Sponge Cake With? Once the cakes are cooled, it’s time to frost. I decided to split the cake layers in two which made for one awesome GINORMOUS cake. You could easily create two normal sized cakes out of this. Or forget splitting the cake layers and just have thicker layers. I topped each layer with stabilized whipped cream and fresh strawberries. 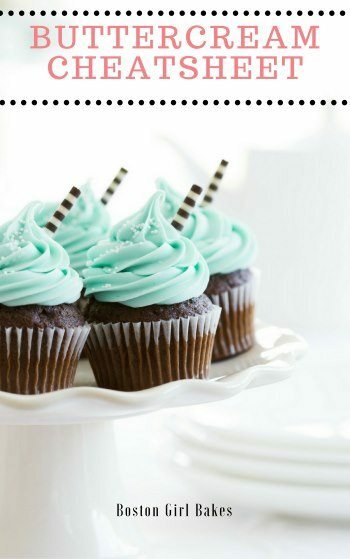 But really you could use whatever type of frosting you want. Maybe a chocolate italian meringue buttercream? Nothing wrong about that. Check out my Ultimate Guide To Making The Best Buttercream Icing if you are new to making buttercream. Can I Make This Cake Ahead? Absolutely. 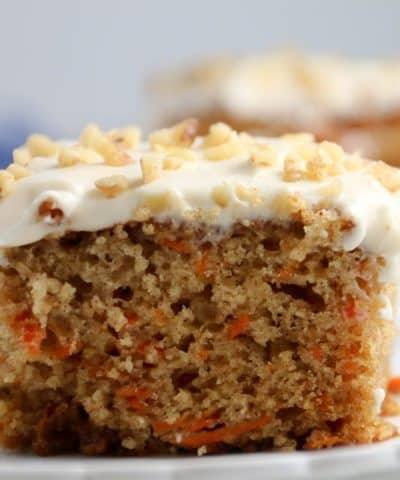 You can make this cake 4 days ahead of time. Just allow the cake too cool, then wrap each layer in plastic wrap and store at room temperature. You can also freeze this cake. Simply wrap in plastic wrap and one more layer of tinfoil or place inside a zip-loc bag. It can be frozen up to 3 months. You can allow it to thaw in the refrigerator, still wrapped, overnight. Then frost as normal. 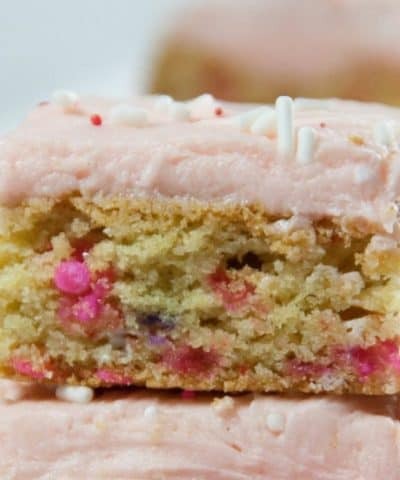 I find frosting a frozen cake much easier and would simply unwrap the cake directly from the freezer and frost frozen. Then serve once it has come to room temperature. Grease the pans properly. There is nothing worse than having a cake that sticks! I find that greasing the sides with shortening works the best. And the addition of parchment paper on the bottom of the pans can ensure the bottoms don’t stick. Be sure to sift and measure your cake flour accurately. If you don’t have any cake flour on hand, you can make your own cake flour. When adding the dry ingredients to the egg foam mixture, be sure to do so gradually so as not to deflate the mixture. One of the reasons that a sponge cake rises and results in a light and fluffy cake is because of the air that is incorporated. So you might not believe me when I say this vanilla sponge cake is perfect. Like that alusive perfect date, it seems like a unicorn. But trust me on this. This is the perfect vanilla sponge cake. 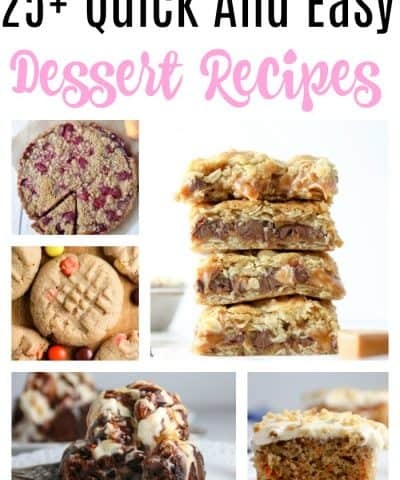 If you love this recipe, then let me know and leave me a star rating and comment below! 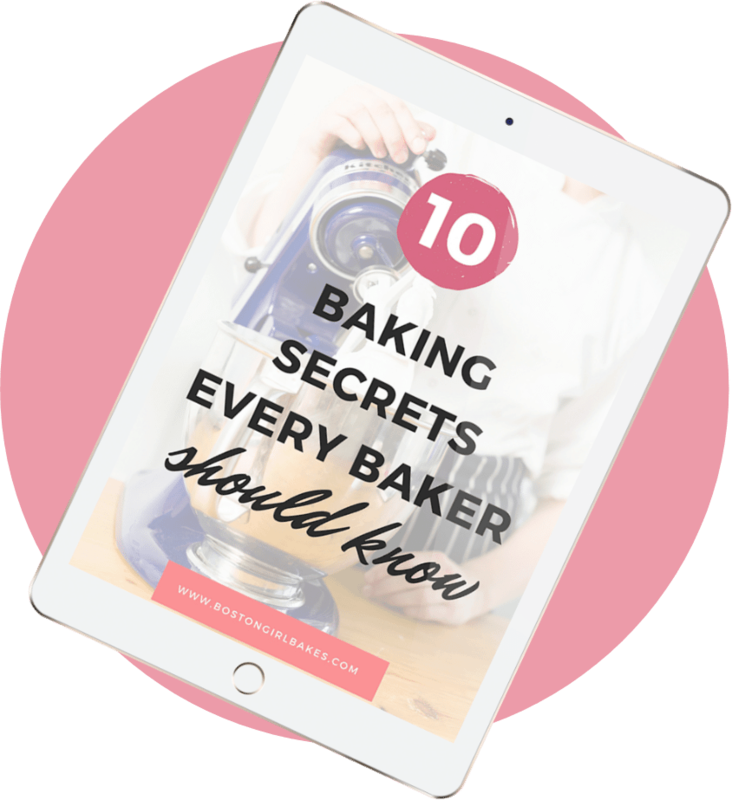 And be sure to download my Buttercream Cheatsheet, which gives you 13 ways to flavor your buttercream! A vanilla sponge cake that is light and fluffy! 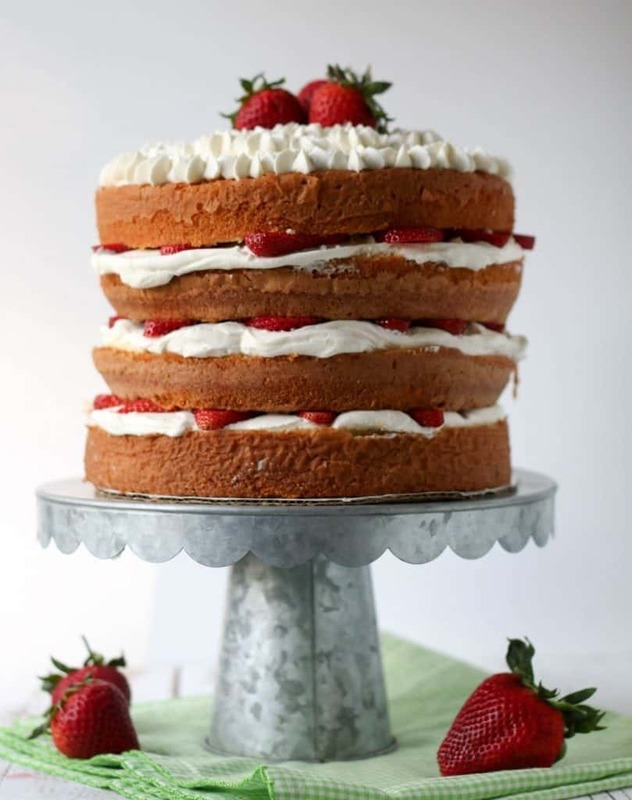 It's absolutely perfect....layer with whipped cream and fresh strawberries! Preheat the oven to 350F/175C, with a rack in the middle. Grease and flour two 8-inch round cake pans..
Make the cakes: Sift the cake flour, baking powder, and salt together in a medium bowl. In a container with a spout (I used my 2-cup liquid measuring cup) whisk together the oil, milk, and vanilla. 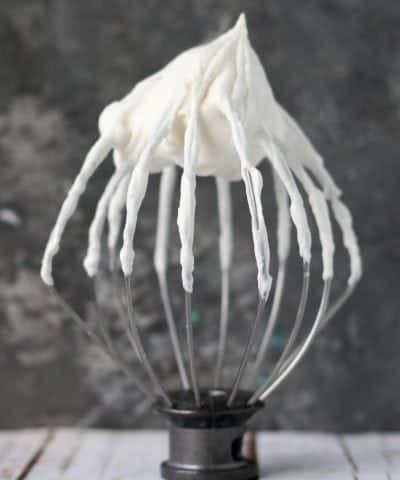 In the bowl of a stand mixer fitted with the whisk attachment (or in a large heatproof bowl, using a hand mixer) beat the eggs and sugar to combine. Set the bowl over a medium saucepan of barely simmering water (with the bowl not touching the water) and heat, whisking constantly, until the mixture registers 105F/41 C on an instant read thermometer. Remove the bowl from the saucepan and whip the mixture on high speed until pale and thick, 5 to 6 minutes. Reduce the speed to medium and beat for 2 to 3 minutes more (this will help stabilize the foam). Sprinkle about one quarter of the flour mixture over the egg mixture and mix on low speed just until incorporated. Add the remaining flour mixture in to 2 to 3 additions, mixing just until incorporated into the batter. Gradually drizzle the milk mixture into the batter, mixing just until incorporated. Place cold water in small bowl and sprinkle gelatin over it. Let sit for 5 minutes. 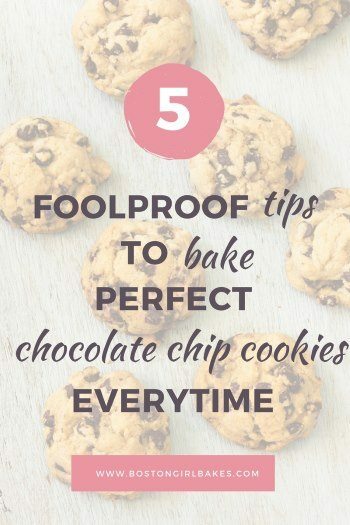 While it's sitting, place heavy cream, powdered sugar, and vanilla in the bowl of a stand mixer with the whisk attachment or in a mixing bowl if using an electric beater. Once gelatin is set, place bowl in microwave and heat until gelatin turns to liquid, about 10 seconds. Grease the pans properly. There is nothing worse than having a cake that sticks! I find that greasing the sides with shortening works the best. And the addition of parchment paper on the bottom of the pans can ensure the bottoms don't stick. Be sure to sift and measure your cake flour accurately. If you don't have any cake flour on hand, you can make your own cake flour. You can make this cake 4 days ahead of time. Just allow the cake too cool, then wrap each layer in plastic wrap and store at room temperature.